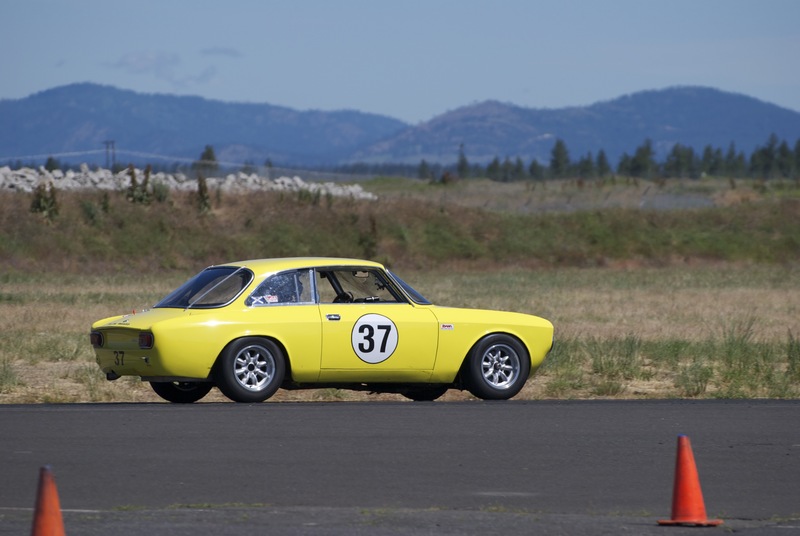 This week was a little bitter sweet at “The Werks”, as our client and good friend Glen Gibbons made the decision to part with his beloved 1969 Alfa Romeo GTV, affectionately named “Alfie”. 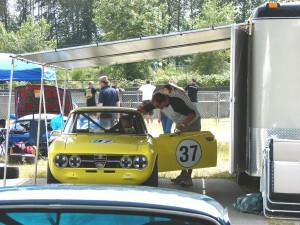 This pretty yellow car was restored and fully race prepared by 900 Werks back in 2007, pictures can be found here. Glen raced Alfie over the past 8 years at various racetracks across the Pacific northwest including: Mission Raceway in Mission, BC and Spokane County Speedway in Spokane, WA. During this time Glen demonstrated the essence a Vintage Racer. Always having the utmost respect for the car and his fellow drivers, never once making contact with another car, something that is not always seen these days in Vintage Racing. 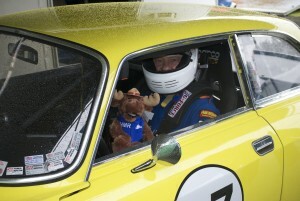 Glen was a gentleman, on and off the track, giving way to other drivers if he didn’t feel he could pass them safely. Beginning carefully, learning the car and his lines around the track. 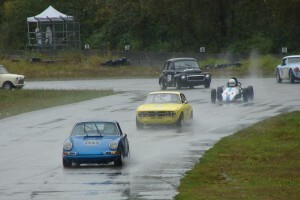 On occasion having to draw on his previous ice racing skills to maneuver the wet track on the rainy days. Glen and Alfie became a great team! This past 2015 season was the highlight of Glen and Alfie’s racing career together, that ended with a storybook finish. During the BC Historics Motor Races in Mission, BC, Glen and Alfie put down some fast laps during qualifying and started their first race in the pole position. 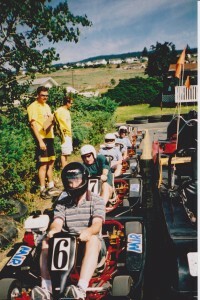 Glen and Alfie remained in the lead until the final lap of this race, when Alfie’s crank pulley broke. Forcing them to make their way to the pits, leaving victory in the mist. As all racers learn and know, it doesn’t matter how much you prepare sometimes parts and components break, especially in vintage racing. Frank and his son-in-law, Oliver Teal, worked through the afternoon and evening to make a repair to the pulley, so that Glen and Alfie could race the following day. 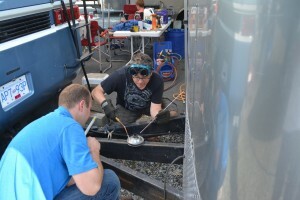 After some creative thinking and tailgate welding, Alfie was ready to race the next day. Starting at the back of the pack they purposefully made their way through the pack to the checkered flag to finish the race first…their first first place finish! No better way or time for a driver and a car to part ways! A lot of reminiscing has occurred this week with the sale of the car. 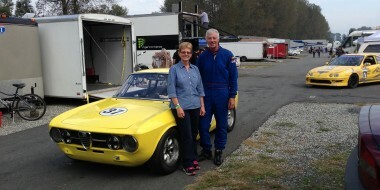 It was concluded that Glen and Frank Winterlik have been racing together for over 22 years. 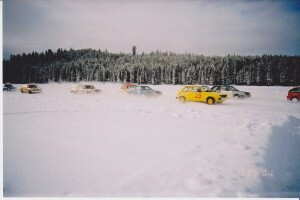 Beginning with ice racing, Frank in a Porsche 914 and later a Volkswagen Scirocco and Glen originally in a Volkswagen Scirocco and then his trusty Volkswagen Golf on various lakes in Kelowna, Lake country and Vernon. With the occasional go karting thrown into the mix. Racing has certainty been the foundation of their friendship and these boys have seen a lot of green and checkered flags over the years. It’s always hard to say goodbye to a good friend, even if it is a car. But in the words of Peter Pan, the boy who never grows up, “Never say goodbye, because goodbye means going away, and going away means forgetting”. We look forward to seeing Alfie around with his new owner and seeing what new adventures Glen and his wife, Karen, will embark on in their next stage of retirement.